Google Form is a web-based application within the free Google Drive suite of tools. It is a great tool for creating forms and surveys and collecting, organizing and analyzing data. Features include the ability to embed a form to a web page, email a link to a form, create spreadsheets automatically from form data, export data in various formats, and choose themes to customize forms. Pasadena City College: Library security incident reporting log. Google Form also facilitates collaboration by allowing questionnaire data to be sent to multiple email addressed as the data is received. 1. Create a Google account if you don’t have one. 2. View this three and a half minute tutorial. 3. Think of a need in your library that Google Form can help you with or you can make one up. 4. Develop your questions. You may want to jot them down first so you don’t have to reorder them later. 5. Select Form from Google Drive and create a survey. 6. Name your form and select a theme. 7. Create your survey using at least three types of questions. 9. View responses as a Google Spreadsheet (Responses –> View responses). 10. View responses as a summary (Responses –> Summary of responses). 1. Go to Google Drive Spreadsheet. 2. Create a spreadsheet (Create –> Spreadsheet). 4. Create a form (Tools –> Create a form). 5. Edit, Send, Go to, or Embed your form (select option from Formmenu). Google Spreadsheet is another web-based application within the free Google Drive suite of tools that allows users to create, edit, and share data. Data from Google Spreadsheet can be exported in a variety of formats including Microsoft Excel. Data in Google Spreadsheets can also be converted to line charts, bar graphs, and pie charts. 1. Think of need in your library that Google Spreadsheet can help you with or you can make one up. 2. 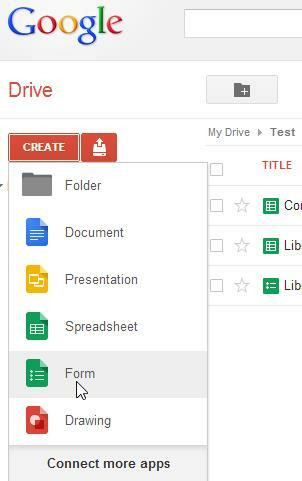 Create a Google Spreadsheet from Google Drive (Create –> Spreadsheet). 3. Choose the file to import (File –> Import). 4. Select your data file (Choose File). 5. Selection how you would like to import your data into a spreadsheet (Import action). 1. Think of need in your library that Google Spreadsheet can help you with (or you can make one up for now). 2. Open an existing Google Spreadsheet file. 3. Select your file export file type (File –> Download as). 4. Save your file or view it as a Web page. Create a Google Form and use an advanced feature. Create a Google Spreadsheet and represent data in a graph, chart, or manipulate data in some other way (See “How to” resources). Post a reflection to your blog. You may want to share your biggest challenges or surprises creating forms and spreadsheets, or share a tip. Please share a link to a form or spreadsheet you created, or share your thoughts about how you could use these tools in your library now or in the future. Are you interested in comparing other survey tools? These are three worth checking out. Doodle offers easy scheduling without having to sign up for an account. SurveyMonkey touts its “the world’s most popular online survey tool.” It offers free basic accounts. eForms allows survey respondents to upload documents when submitting questionnaires. An online file storage account is required, but free individual accounts are available.